Root canal treatments can save your natural tooth. It's unfortunate but true that our teeth sometimes deteriorate to the point that the root cannot be saved. Fortunately, our teeth have the ability to survive even if the nerve is removed. The best option for your oral health is to keep your own, natural teeth. The “root canal treatment” refers to the procedure of removing the infected pulp tissue and nerve from the root canal, disinfecting the tooth canal then sealing it to prevent further damage. Root canal treatment is NOT a painful procedure; it actually relieves pain if there is a severe infection. Sometimes a Root Canal Treatment is necessary EVEN if you do not have any pain; the decay process may be well underway. Extraction isn't a better alternative to root canal treatment; it is always preferable to keep natural teeth when possible. 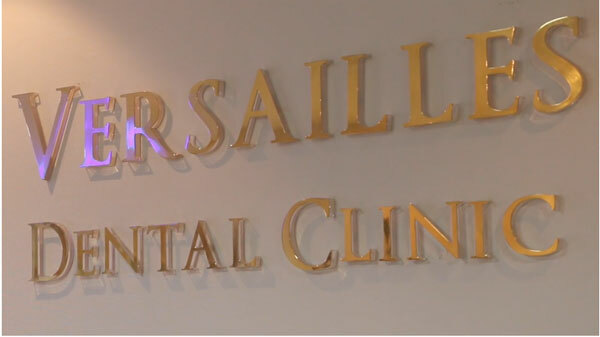 A root canal treatment at Versailles Dental Clinic requires ONE APPOINTMENT ONLY* and comes complete with a full reconstruction of the tooth and ceramic crown. *In rare cases, if the infection is too big, it may take two appointments. Symptoms of this infection include pain, sensitivity to hot or cold, tenderness to touch and chewing, discoloration of the tooth or swelling and tenderness to the lymph nodes. However, sometimes there are no symptoms and this infection can only be detected by your dentist through regular exams. The Root Canal procedure involves removing the infected pulp, cleaning the tooth canals and then filling the tooth. The dentist may need to place a crown or other dental restoration on the tooth to protect and return it to full function. The most important step of the treatment is to ensure that the root canals are properly cleaned and disinfected and that all the infection is removed from the canal or around the tooth. This is why at Versailles Dental Clinic we use the inovative technology such as LASER and OZONE therapy during root canal treatment. The ozone molecule is the most powerful agent that we can use on microorganisms. Once the damaged tissue is removed the root canals are exposed for few seconds to ozone therapy the purpose is to remove any trace of bacteria. It kills bacteria, viruses, fungi, yet the more highly evolved human cells are not damaged by ozone in lower concentrations. Ozone’s pioneering use in dentistry naturally followed for root canal treatments, but also for reversing cavities!